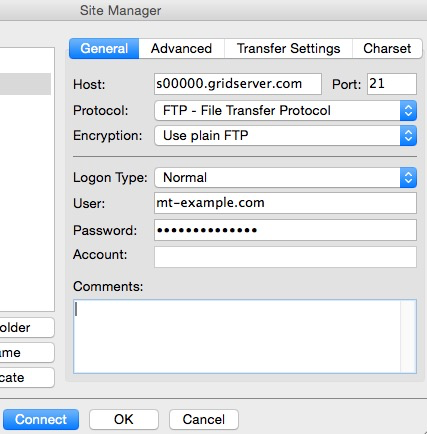 FileZilla is a free, open source FTP client for Windows, Mac OS X, and Linux. It supports both FTP and SFTP, and can be used with all (mt) Media Temple services. The first thing you need to do is download a copy of Filezilla at https://filezilla-project.org/download.php?type=client. Please follow the installation steps to install the application on your computer. Remember to replace example.com with your domain name. The following tutorial is provided as a courtesy to our customers to help you configure your ftp software to work with (mt) Media Temple's hosting solutions. Third-party software can not be supported directly by (mt) Media Temple. If you have further questions about configuring FileZilla, please visit http://wiki.filezilla-project.org/Using. For a recent security notice regarding FileZilla, please click here. Username: Your primary domain or FTP username. 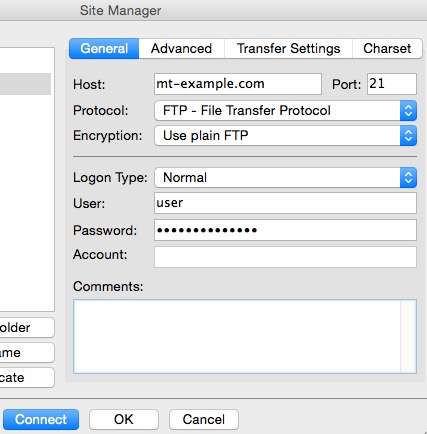 Once FileZilla is installed, we can create a bookmark for your FTP settings using the Site Manager. Click on File then Site Manager. 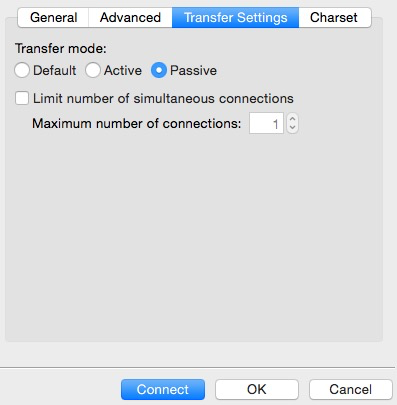 Enable Passive Mode: Click on Transfer Settings and under Transfer mode, select Passive. If you have trouble connecting, you may also want to click on "Limit number of simultaneous connections" and type 1 in the box.